SnapLogic solves a big problem for companies. It helps them connect legacy data sources to the cloud or to an in-house data lake. Today, it announced a $40 million round, almost exactly a year after announcing a $37.5 million round. The round was led by European private equity firm Vitruvian Partners with participation from previous investors Andreessen Horowitz, Capital One, Ignition Partners, NextEquity Partners and Triangle Peak Partners. With today’s money, SnapLogic has raised a total of $136.3 million to date. The company has been on a roll since last year when we last spoke to them, adding 300 new customers, bringing their total number to over 700. The customer list is loaded with big name companies from investor Capital One to Del Monte and Kraft to Verizon (which owns this publication) to Adobe and Elon Musk’s SolarCity. CEO Guarav Dhillon says he went back to the investment well to fund his company’s increasing global expansion — and because it’s a prudent investment strategy. “Our approach is to do successive up rounds with straightforward terms rather than chase a big slug with onerous terms. We built Informatica with just $13.5 million, so my approach is to raise funds as needed,” he explained. As for going with Vitruvian as lead investor, Dhillon says this was by design to help give them a foothold in Europe and build on their US investors from past rounds. ” We already have the best in the west (A16Z, Floodgate, Ignition, Microsoft, NextEquity, SilverLake and Triangle Peak). Vitruvian are forward-looking investors who can help us grow globally,” he said. 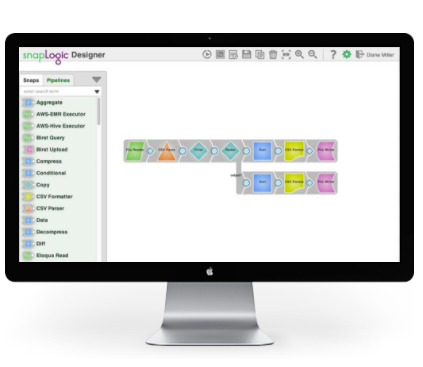 SnapLogic produces what it calls “snaps,” which are essentially pre-designed connection packages designed to link to various data sources. There are hundreds of snaps to connect to disparate data streams such as SAP, Twitter, Workday, Salesforce and even machine protocols. The SnapLogic cloud service consists of a designer, manager and a dashboard for monitoring your snaps. The beauty of the approach is that you drag various snaps into the designer interface and you can build these connectors without coding. When a process touches multiple systems, getting the data to move between those systems is a huge challenge for companies. It’s the pain point that SnapLogic is trying to solve — and it is obviously catching the attention of investors who have forked over more than $77 million in the last year to help them along. When a company is growing as quickly as SnapLogic, it requires bringing on new employees and that takes a cash infusion. The company plans to add additional sales, marketing and customer service as it continues to expand globally to meet its new customer demand.